If you often have to do repairs and other household chores with your own hands, you probably need to use a tool like a circular saw. And if you still haven't got your own, now is the time to do it. But first you need to know which circular saw is best to buy. Modern models allow you to quickly and accurately cut a variety of materials: from wood and its derivatives, to laminated panels and plastic. Therefore, it is very important to know what characteristics you need to pay attention to in order to choose such a circular saw, for the purchase of which you will never regret. When figuring out which circular saw to choose, you will need to take into account many circumstances and pay attention to a number of important features of this tool. 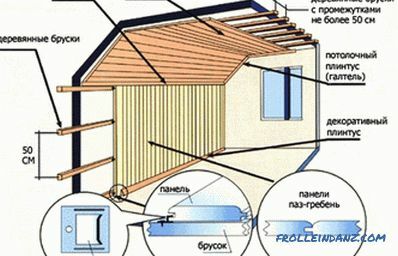 Of course, you will be able to find out about all the points of interest in addition, already choosing a saw in the store and communicating with the seller-consultant, but before that it will not be superfluous to prepare at least a little for the purchase and understand the main points. Often, buyers who decide to purchase a circular saw are guided by the conventional classification of these tools into household and professional models. So, the household saw will be suitable for periodic use. You will not be able to work with such a tool for a long time without a break, since it needs periodic rest. The professional tool was created specifically for long and intensive use. Thus, circular saws of these two classes differ from each other in their functionality and, of course, cost. 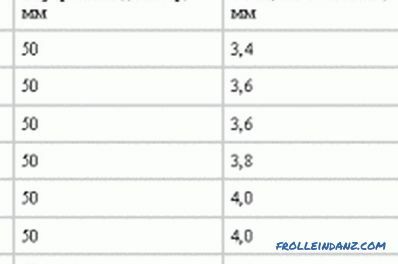 Table of characteristics of circular saws. 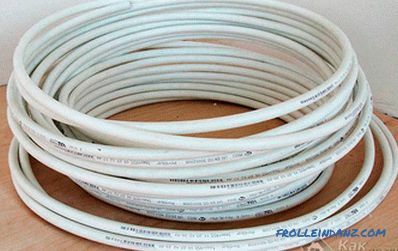 However, quite often it happens that household circular saws serve for many years without any complaints, and professional ones break quite quickly. Many reasons can lead to this - a violation of operating conditions, a confluence of circumstances, etc. Therefore, when choosing a tool, it is necessary, first of all, to imagine why you need it and what you will do with it. And taking into account the goals of acquiring a saw, consider the characteristics of each individual tool. One of the main parameters of any circular saw is the diameter of its disk. 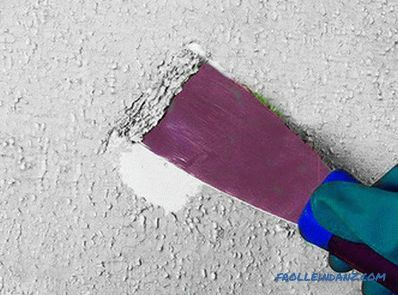 All other features of the tool directly depend on this characteristic, in particular - the maximum cutting depth. Circular saws are on the market in the largest assortment, providing a cutting depth of about 50-65 mm. With such a saw, it is possible to solve almost all the main tasks of sawing, the tool has quite good maneuverability and does not require much physical effort from the operator. Tools with a more modest size are also presented - from 4 cm. Such saws have a relatively modest size, and their scope is limited to thin materials. With a great desire, such a saw can also cut a rather thick beam, but then the workpiece will have to be sawed from two sides. The "giants" are also represented in the range of professional models, providing cut depths of the order of 10-13 cm. They are perfect for large volumes of work when you need to ensure high performance. 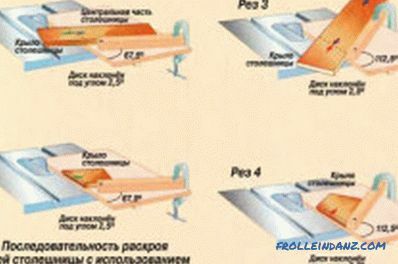 In such situations, it makes sense to pay attention to saws with the possibility of stationary installation, since such models usually have a weight greater than 10 kg, and without a stationary installation, the operator will get tired quickly and will not be able to ensure proper accuracy execution. The outer diameter of the disk is directly related to such a characteristic of the instrument as its power. On the power you need to pay special attention. During operation, the tool is subjected to quite significant loads that have a serious impact on the engine. Therefore it is better to buy an engine with a margin. Otherwise, not only the quality of work will deteriorate, but the saw itself can quickly break due to constant overheating. What you need to know about the base of the circular saw? When choosing a circular saw, it will be useful to pay attention to its base. As a rule, if the budget allows, professionals advise to give a choice in favor of the cast sole, and not stamped. It differs in higher rigidity, stability and durability. However, there are a number of important nuances. For example, stamping from thick steel according to its characteristics is practically not inferior to cast options. In addition, if the tool is not installed in a stationary position, then the requirements for the stiffness of its soles are also reduced. Before you buy some vending tool, you must test it.Sawing something you are unlikely to be allowed, but to hold the saw in your hands, turn it on, to assess the level of noise and vibration is a must. 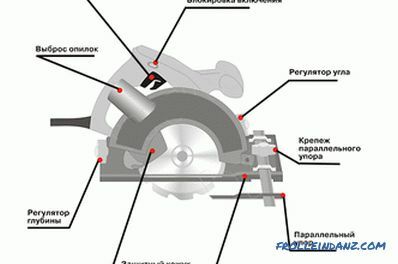 Diagram of circular saw blades. Circular saw is a potentially dangerous tool. Therefore, manufacturers must complete their products with various devices to protect the user from accidents, injuries and damage. The elementary remedy that any circular saw should be equipped with is a protective cover. This device consists of the upper part, which covers the saw blade all the time, and the lower part, which is movable and covers the disc only when the tool is not working. The category of elementary and mandatory protective equipment also includes blocking the accidental activation of the saw. Usually it is located on the handle. When you press this button, the ability to pull the trigger will be blocked. Such tools must necessarily be equipped with a safety clutch. It will work if the tool suddenly sticks. When the clutch is activated, the shaft will continue to work, but the disk rotation will stop. This will allow the instrument to remain intact, and the operator will not get injured. Professional saw models are usually equipped with an electronic disk stop system. Thanks to this system, the disk will be stopped almost immediately after the engine is turned off. This option simultaneously protects the operator and prevents damage to the workpiece. The circular saw is not a tool that needs to be stuffed with a variety of electronics. For example, even the function of electronic speed control is not found on every model. When working with wood, it is not particularly necessary, but if you have to cut plastic, if possible, buy just such a saw, because if the disk rotates too quickly, the cutting place will quickly melt. Both low-cost household and expensive professional saws are equipped with soft start systems. This system helps to reduce the shock loads on the gearbox. More expensive professional models are equipped with an electronic system that provides a constant speed of rotation of the disk under load. The functions of this system are clear from the name: it is necessary so that the disk rotates at the speed set by the operator, regardless of what load is placed on the engine. This option is often present on those saws that do not have the electronic speed control function. A rather rare electronic function is the overload protection system. It, as a rule, can be found only on expensive models of a professional level. Thanks to this system, the temperature control of the motor windings will be ensured, and when there is a voltage surge or other danger, the saw will be immediately turned off. Scheme of a home-made guide rail for the circular saw. A good addition is the guide system. Thanks to the guide bus, you can achieve higher cutting accuracy. 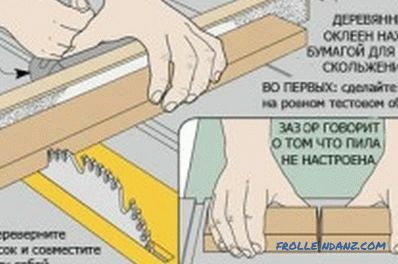 Some craftsmen save and use a homemade version - a guide in the form of a board with a thickness of about 10-15 cm. The board must be wide enough. Others buy a universal factory production guide. Regardless of which option is chosen, the third-party guide will still be in some sense “handicraft”. 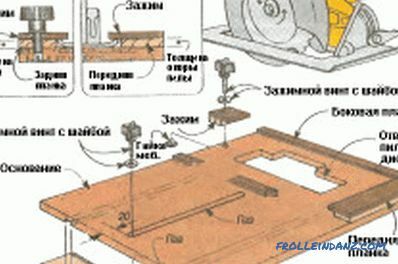 It is best to use the guide, originally created by the manufacturer for a specific model of the saw. If necessary, almost any circular saw can be turned into a small home sawing machine. This requires a special table. However, many modern models work fine without additional bulky equipment. You can do a couple of special clamps. With their help, the disk guard can be pulled to the edge of a simple table, workbench, or to an ordinary long board. Circular saw blade application schemes. 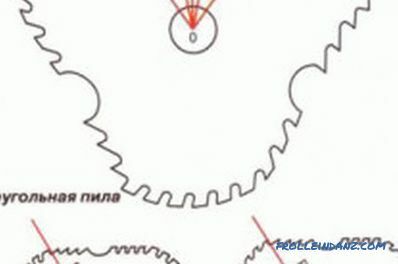 Learn the additional features of circular saws, maybe some of them will be useful to you. For example, if the saw is equipped with a removable network cable, such a tool will be more convenient to store and transport. Some models are equipped with a function that allows you to quickly determine the wear of the collector brushes. And with the help of the spindle lock button, you will be able to independently, quickly and safely replace the saw blade with a simple wrench. 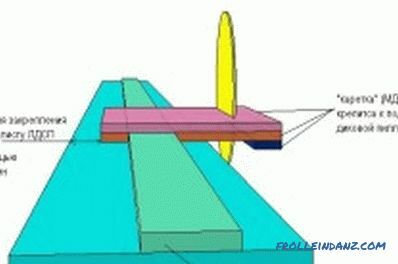 Are accumulator saws convenient in operation? When choosing a circular saw, you will surely come across accumulator models. They are widely represented in the assortment of any more or less large manufacturer.Like any other cordless tool, such circular saws have both positive and negative qualities. Among the main advantages are the independence of the tool from the power grid and maximum mobility. The weak side of such saws is the short duration of work. Therefore, it makes sense to give a choice in favor of the battery model only if you know that you have to work in an area without a power supply network. Remember, if a conventional net saw and a rechargeable model are about the same, the net option would be preferable in all respects. Circular saws are equipped with tooling in the form of saw blades. It is necessary to pay attention to 2 main parameters of this equipment - landing and outer diameter. 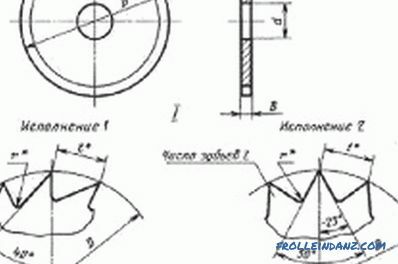 With the outer diameter, as noted, the maximum cutting depth, power and other characteristics are related. And with the help of the landing diameter value, the user will be able to independently buy, if necessary, suitable additional webs. However, there is the possibility of using "non-native" landing sizes. In this case, you will only need to purchase an adapter ring. Manufacturers categorically do not recommend using saw blades of inappropriate external diameter, since it is dangerous both for the tool itself and for the operator. The saw blade offered by the manufacturer with the saw affects the quality of work and the cost of the tool. You can follow the simple rule: a neat, clean cut can be obtained using a disk with small teeth, and if volume and productivity are important, then you should opt for cloths with large teeth. Discs can be carbide and monolithic. The first have special soldering on the teeth. They are made, as a rule, from cobalt or tungsten. Monolithic discs rarely come complete with a saw and are used to process plywood and soft wood. Such canvases rather quickly become dull. Have to regularly sharpen and part teeth. But this option has a rather significant advantage - such a disk can be re-sharpened several times on its own. The saw blades with taps are designed for working with metal, laminated panels and hard wood. They provide the highest quality cut. These disks are somewhat more expensive than monolithic ones, however, they serve much longer. That is why carbide discs are the most popular and preferred - they definitely pay off even without regrinding. Tilt angle and number of teeth. Discs may have a different number of teeth. For the finishing work traditionally used discs with a small number of teeth (no more than 24). Finishing transverse cutting is performed with the help of blades with already large (up to 48) number of teeth. For the processing of chipboard, wooden blanks with knots, laminate is best to use cloth, equipped with teeth with trapezoidal napaykami. Non-ferrous metals are sawn with disks with the number of teeth from 64. Additionally, you need to know about the features of replacing the saw blade. If the saw design provides the ability to lock the spindle, then you will be able to replace the tooling with one wrench without any special problems and difficulties. In the event that the possibility of locking is not provided for, you will need 2 keys and, if possible, an assistant. Now you know which parameters you need to pay attention to and you can easily figure out which one is the best to choose a saw. Happy shopping!